A well-researched target keywords list is where all search engine optimization (SEO) efforts should start for your website. This list is used to drive both organic and paid techniques as well as on-page and off-page methods. We provide SEO Keyword Reports for organic optimization with all the data you need. We’ll analyze your industry and do all the research. 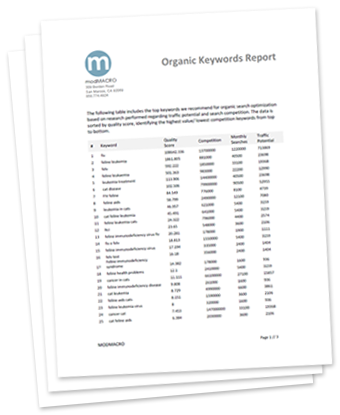 You’ll get an easy-to-understand report that identifies the keywords you should optimize for based on traffic potential and competition. If we’re working on an existing site we can also provide a detailed report that indicates your search engine positions for each of the target keywords. Already have a preferred web professional or in-house developer? If they don’t have the right SEO tools and expertise we can help. We’ll perform the analysis and provide the reports to your development team for implementation.